Oklahoma native, Steve Seikel, is the one to blame for the favorited Oklahoma Gold Mustard. He's been making mustard for years and finally has blessed the public with his very own recipe. 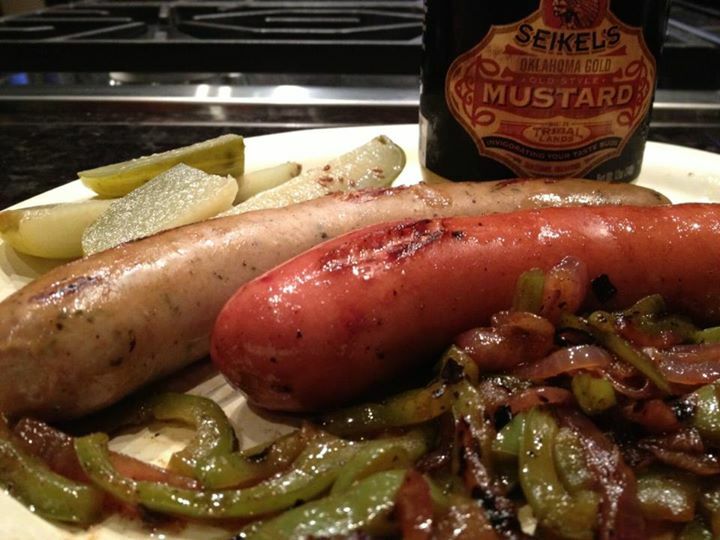 Seikel's Mustard is a little hot, a little sweet but it's mostly delicious. 1. Place mustard and sugar in a non-reactive mixing bowl and whisk to mix. Gradually whisk in vinegar, oil and hot sauce. Season with salt and pepper to taste; the dressing should be highly seasoned. Set dressing aside. 2. Finely chop cabbage in a food processor fitted with a metal chopping blade, running the machine in short bursts; this is a chopped, not a shredded, slaw. Work in several batches so as not to overcrowd processor bowl. 3. Finely grate carrot by hand or use shredding disk of food processor. 4. Add cabbage and carrot to dressing and toss to mix. Taste for seasoning, adding more salt and vinegar as necessary. The slaw tastes best served within a few hours of being made but can be refrigerated, covered, for a day or two. 1. Heat the half and half and honey over a low flame or double boiler. Whisk the egg yolks and sugar together until combined, and temper them slowly into the pot of milk and honey. Continue to cook until the mixture is thickened and holds a line on the back of a spoon. 2. Chill the custard base for about 4 hours or overnight. Before adding to the ice-cream machine, whisk in mustard to taste. Freeze in ice cream maker according to manufacturer's instructions.